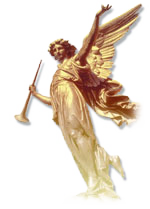 Ranks of angels provide an interesting metaphor for our different thoughts and attitudes. I was thinking about thoughts. Well, actually I was just watching them go by. It occurs to me that there is some hierarchy of thought. Kinds of thought--maybe like the different kinds of clouds. There could be cirrus thoughts, nimbus thoughts, cumulus thoughts or just plain foggy thinking. Totally fogged-in thoughts, zero visibility. Maybe that's the condition of not being able to see beyond our own conclusions. Anyway, certain thoughts are a lot better – or at least they make you feel better – than other thoughts. The thought, "I was right" feels better than "maybe I was wrong." It's also more effective to think, "I can do it" than it is to think, "I tried and it can't be done." Some thoughts we create, and some thoughts just seem to come in because someone left the door open. It's as though we each live in a boardinghouse mind, and thoughts are the roomers (play on words) coming in and out of our boardinghouse minds. Some are uninvited guests, and some are more welcome than others. Some of them just stand in the hall and repeat the same line from a song over and over. Do you wonder why you entertain them at all? And when a thought moves in and takes up permanent residence, you have an opinion! One of the definitions of the word "angel" is a messenger, or thought, from God. In place of thinking of thoughts as intruding guests, we could think of them as angels! We wouldn't be the first to think that way. Instead of saying I had an idea, we could say, "An angel appeared to me." Instead of sharing our thoughts with someone we could share a chorus of angels with them. And rather than saying the world began as thought, we could say that the angels built it. Did you know there is a hierarchy of angels that is analogous to the hierarchy of thoughts: ranks of angels corresponding to kinds of thinking. Let's see if l remember: an archangel is just above an angel, and the next one higher is called a principality – a prince of angels. Then there are "powers," "virtues" and "dominions." I think that's the right order. And the three top ranks are "thrones," "cherubim" or "cherubs" and "seraphim" or "seraphs." 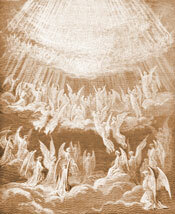 Cherubim and seraphim are very powerful and guard the throne of the creator. As long as they are on duty, nothing gets by them. 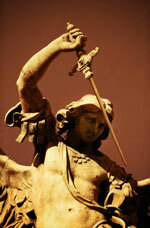 Cherubs are often depicted as winged faces, Sometimes carrying a flaming sword. Seraphs are described as pure white-burning love light that cannot be contained. And whose throne is it that they guard? Who is the ruler of your thoughts? Have you abdicated your throne? What thought sits on your throne? I am. And when you rule from your throne, what thoughts protect you and keep you strong? Love and faith. They are your cherubim and seraphim! Angel ranking began in the fifth or sixth century, and most church scholars think it began with a writer calling himself Dionysus the Areopagite. There are many biblical references to angels, particularly in Isaiah, and "winged messengers" are common in hieroglyphs. But it was apparently the Areopagite who cataloged them into nine ranks with each rank responsible for part of creation. I suspect that Dionysus the Areopagite was creating an allegory to avoid offending church elders. Only a select few understood, or even suspected, that there were psychological counterparts to his angel ranks. I guess we can imagine the kind of thinking that Lucifer, the fallen angel, represents. Have you ever felt that your own thoughts were rebelling against you? Are addictions, desires and cravings anything other than a descent into the lower regions of self-deceptive thought? Craving thoughts are Lucifer's, right? I guess if we consider that fallen angels correspond to self-deceptive thinking, we'll get some idea of the direction in which self-deception leads. But before we hit bottom, we can save ourselves by calling forth our cherubim and seraphim (love and faith). These are the mental attitudes that guard our thrones. So what I was getting at is that there are different kinds of thoughts and different kinds of thinking. You can create a thought. You can just sit there and totally bloom a thought, and it's not necessarily motivated by anything outside of you. It's a thought-angel that you send forth. It's not a thought that is dependent on, or a reflection of, the world around you. It's a thought-angel that you originate. You can create a thought for no reason (a thought-angel), and then you can create a reason for having created that thought. The second thought is inspired by the first thought (a response), but the first thought--that's your seraph! It was not a response to anything else. It was not a comment or an opinion about reality. It was a thought-angel that you created. Now this idea comes as a surprise to some people. They start wondering if their stimulus-response model--where the world is stimulus and thought is response--might have some holes in it. I'd say it does. For one thing, they're going to have a devil of a time explaining where the world that causes them to think came from. They're going to have to create a creator. That is a pretty neat trick. Let's not go down that path this time. Let's just sit on our I-am-thrones and send our cherubim and seraphim to create the world the way we want it. The world begins as thought-angels. Your thought- angels! That's where reality comes from. Create the thought, "I am happy." Now that's a seraph thought. You just create it. You don't have to consult reality to see if there is any reason to create it; it is true because you say it is true. Now create the thought, "I create love." That's a cherub thought. You created it. You could also create, "I can't create love." Either way, the truth of the thought is the thought; it is not dependent on the world. When you cause you to think, you're God of your universe. You send forth angels. When the world causes you to think?the world you created?you have fallen into the regions of self-deceptive thought. Do you see the difference? A created thought (an angel) creates a reality, but a response thought creates a lie. What is the lie? It's simply, "I didn't do it!" Well, you might be able to pull that on your mother, but you're wasting your time trying to convince me. When you are God of your universe and you decide something, your angels make it happen. But you have to be God of your universe to do that. Some people try to make something happen with a response thought (a lie) rather than a created thought (an angel). It's the difference between a fantasy and a thought that creates a reality. A thought-angel becomes a fact. So there is a person on an airplane, and he looks out the window and the engine is on fire. Boy, does that cause some response thinking to occur! "I'm going to crash!" Fortunately, that is only a response thought, if it was his deliberately created thought he wouldn't have a chance. He would have created the fact of the crash. The way to handle an emergency is to hurry back to your throne and take charge of the angels that have already been created. Something like this: "I am. I am on an airplane with an engine on fire. I am frightened. So be it." (Now for some new angels.) "I am going to make it! I am safe! The airplane is safe!" You have to be a creator to create anything. The question is how powerful of a creator can you become? People who attempt to create "because of..." don't create very much. Mostly they create worries. They worry themselves and they worry others. They will try to convince you that some reality is more powerful than you are. Ultimately, that is a lie. There is a funny little game that goes on all the time. Someone creates a thought. The thought creates a reality. The reality causes other people to think. Of course, if the reality is getting them to think, they are not the creators of their thoughts. Unless they create that they created the other person to create that reality. It's a funny little game, don't you agree? You only lose when you won't take responsibility for creating the other guy. Can Avatar help me with my relationship? For most people relationships begin when they create mental impressions of each other. Without these mental impressions, they might not recognize each other. Your mental impressions of other people are strongly colored by your own preferences, assumptions, and past. You take a sampling observation of the other, colored by the moment and event, add your conclusions, and then pull a costume from your closet and hang it on them. Will you be this costume for me? Sure, if you will be this costume for me. Fred and Ginger, James and Moneypenny, or mom and dad, dance off together. The primary relationship is between you and your costume. These costumes are like adult dolls that you play with, fight with, and share your lives with. As long as the person assigned to the costume does not interrupt your game with actions out of character, things will go pretty much as you expect. To go beyond your fantasy costume relationships, you must drop all of your mental representations of the other and meet them as a stranger / undefined being. This happens naturally on Section III of the Avatar Course. Relationships are renewed on a more honest level. By the way, you can also drop the mental representation you have of yourself and experience a liberating freedom. Going through the exercises in Section III was a unique and profound experience for which I feel blessed to have as a useful procedure that I can use on my own, whenever I choose. I did not experience any notable change at the time, other than being in awe of how inspiring and intelligent it is... no, it has been in the 'aftermath', that as I write, I have observed a dynamic shift in my psyche (persona). I feel a lightness in myself. There is no tension in my body. (This is more than after a massage or meditation.) I feel a confidence I've never felt before and have been pleasantly surprised by my manner of conducting myself in conversation. There is something different in the way I'm presenting myself that has never existed in me and it's happening on a deep feel-it level!! I am delighted to write that I truly believe permanent change is possible for me – the change I've efforted for many years I had almost given up on before Avatar. There is more to come as I now confidently place my attention on preparations for The Master Course. See you there! –G.G. I feel like I've been reborn. That doesn't mean that I became another person. I feel like I've been restructured into a new me that accepts the future, recovers peace of mind; that goes towards where my essence wants to go. The space of the Avatar Course is unique. There are people of different ages, occupations, and social status, but there wasn't any concern about that. Superficial differences don't have any relationship with the person. It feels pleasant to be integrated. Feeling confidence to do whatever I want. It's not a feeling that joy is coming from somewhere, it's rather the feeling that joy surrounds everything. It's not moving with the power of a belief. It's just myself moving. –T.A. This was the MOST amazing experience of my life! My wife attended the Avatar Course and when she called to talk during the course, the entire room I sat in glowed with the radiant light she was emitting from her new found consciousness. I knew she was on to something. Seeing the change in her made me hunger for something so profound it changed everything I knew about my life (pain, suffering, doubt, fear, anger). I was hesitant at first. I expected a slick sales approach and thousands of manuals, key chains, bumper stickers to buy to feel part of the movement. Boy, was I in for a shock. I've never felt such love and acceptance from the room full of students, Masters, etc...it was OK to say anything, feel anything. No right, no wrong, just love! I didn't know what to do at first. Lots of painful stuff to deal with, so little time. But the tools were there, and so was the loving, caring help to guide me along. The journey was rough at times because I chose it to be. The simplicity was what worked. The experience is so powerful, it can't be described. Truly wonderful. –D.R. While doing one of the exercises, I realized that I had the power to give a memory it's charge. I made it good or bad, devastating or exhilarating. When I released my judgment, they just became experiences; just part of my life journey, not charged with emotion. It was like my life's baggage was left on the platform. I was free and light as a feather. –J.L.F.